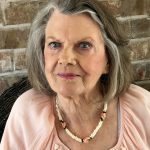 Charlene Spencer Riscky, 82, of Granbury, Texas passed away on Thursday, April 5, 2018. Service: 11:00 a.m. Saturday, April 14, 2018 at Martin’s Funeral Home Chapel, Granbury, Texas. Visitation: 7:00 – 9:00 p.m. Friday at Martin’s Funeral Home. Charlene was welcomed into the home of Alton and Billie Faye Hilliard Hampton on September 22, 1935 in Denton, Texas. She enjoyed golfing, painting and listening to Christian music and teachings. She loved her dog and her family. She will be missed by all who knew and loved her. Charlene was preceded in death by her first husband James Spencer and her second husband David Riscky; grandsons Joseph London and Matthew Simmons, daughter Sharon Jenkins, granddaughter Alayna Hulvey, sisters Sylvia and Gloria Hampton and her brother James Hampton. Survivors: son Royce Simmons, daughter Cynthia London Weatherby; grandsons Glen Paul, Eli Simmons and Mason and Logan Weatherby; granddaughters Crystal Smith, Christina Paul, Mare and Grace and Lara Simmons; 14 great grandchildren and 5 nieces and nephews. Heartfelt sympathy in the loss of our dear Aunt Charlene. She will always be remembered for her beautiful smile, infectious laugh and warm spirit.